The DEP has announced that they will be allowing vehicle access to two of the Enivronmentally Sensitive Areas (ESA) during hunting season this year. A pass can be picked up at Atsion or Batsto offices. The passes are valid from 9/24/16 – 01/01/17. The specific ESAs that will be accessible have not been identified, but we will seek clarification on which will accessible and update you. 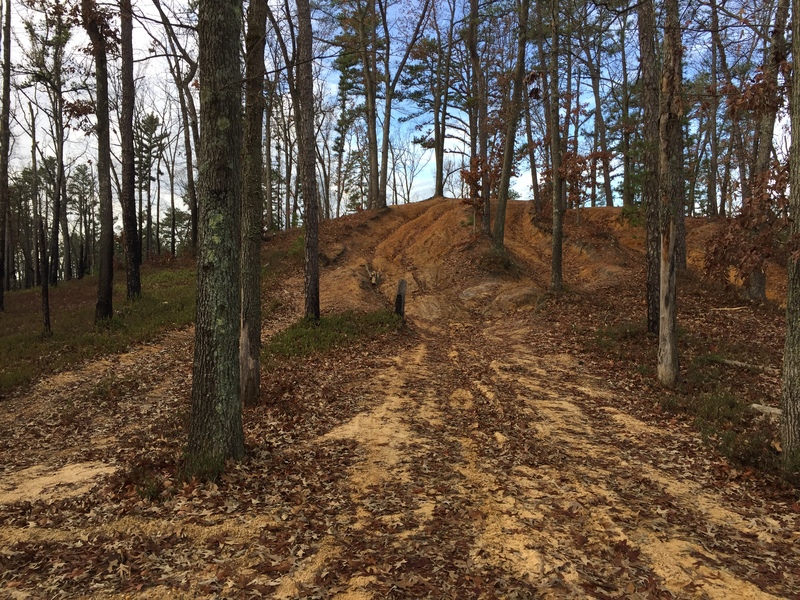 In 2016, the Department of Environmental Protection (DEP) designated areas on Wharton State Forest to be environmentally sensitive areas (ESA’s) for plants or wildlife. As a result, the State Park Service installed signage to advise motorists accordingly as to the locations of these ESAs and State Park Police have vigorously enforced off-road offenders. The DEP is providing limited, off season vehicle access to licensed hunters into two specific areas. No cost vehicle access passes shall be issued as part of in-person registration at Wharton State Forest’s Atsion or Batsto park offices during normal business hours. One pass shall be issued to each hunter holding a valid automobile driver’s license. The pass must be carried in the vehicle while driven within the two specific ESA’s and left in plain view in the windshield whenever parked with the hunter afield. Additionally, the vehicle access passes are non-transferable. State Park Police may issue summonses to any driver operating within the two specific EASs who fails to possess the hunter vehicle access pass. Additionally, motorists may NOT operate vehicles off the roadway. No entering fields, bogs, swamps or adjacent woodlands. Passes will be available at 9:00 A.M. on Saturday, September 24, 2016, and will expire on January 31, 2017 coinciding with the duration of the Winter Bow Season. The program will be evaluated throughout the fall and early winter for next year. Hunters must abide by established seasons and regulations while afield. Now that the heat of summer is breaking, we plan to get back out to Jemima Mount to complete the project we started there. We will finish filling the trenches with deadfall to prevent further erosion. We will also be extending one of the railings to prevent go arounds. The first part of the project that we completed in the spring has been a great success so far, proving that we can create solutions to problems without mass road closures. Let’s keep up the good work! Please join us! 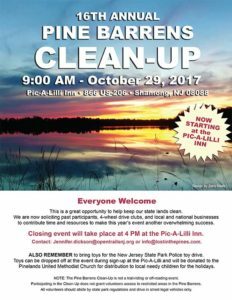 You can meet us at Atsion Ranger Station and 9:00 AM 10/2. If your vehicle is not able to make the trip, we can carpool. Alternatively, you can meet directly at Jemima around 9:30AM. Any questions, please post in the comments. -We will be dragging nearby deadfall into the trenches so it is recommended you wear a good pair of work gloves. -If you are attending, please RSVP to this event so we can get a rough headcount. 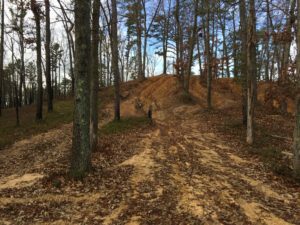 John Druding of Open Trails had a conference call with the Director of Parks and Forestry, Mr. Mark Texel, regarding the DEP’s plans for Wharton State Forest. Mr. Texel shared that the DEP has identified several “Environmentally Sensitive Areas” or ESAs, in which motorized vehicles are not allowed. The ESAs are mostly bogs, but do include a very small number of roads, specifically, East Stokes Rd and Hampton Gate/High Crossing Rd. All the ESAs have been posted and Mr. Texel has confirmed that there are no additional closures planned. That being said, that doesn’t mean that there will never be another closure, however, Mr. Texel confirmed that any new closures will involve the stakeholders. The primary purpose of the posting of ESAs is to facilitate enforcement by allowing charges to be able to be upheld in court, a previous serious impediment to enforcement. Regarding the closure of Stokes and Hampton Gate/High Crossing, the DEP is aware that these are major roads with a long history, however, they are currently in disrepair. As a result of their status as historical through ways, they will be considered for repair in the 2016 maintenance budget. Overall, the impact to motorized access is extremely small, only a fraction of what would have been lost with the original MAP plan. Open Trails supports the plan that the DEP has laid out as it is good compromise between access and protection of the forest’s resources. The DEP released their new plan at the stakeholder meeting last night, which OTNJ and other stakeholder groups were a part of. The plan consists of stepping up enforcement and protecting environmentally sensitive areas. Technology and equipment, including cameras, helicopters, drones and new vehicles will be brought to bear to enforce rules that already exist and are in place. The plan does not include mass, indiscriminate, closures of roads. Entrances to the forest will be marked with signs that warn that the area is patrolled and the laws will be enforced. Violators will face stiff fines including possible impoundment of vehicles. The signs posted will help charges to be able to be upheld in court, a previous serious impediment to enforcement. Focus on maintenance will be increased, however, it is acknowledged that there is a shortfall between what is wanted and the funding available. This plan was forged with input from thousands of stakeholders including environmental groups, hunters, hikers, kayakers, horseback riders and 4×4 enthusiasts. In any compromise, not everyone will be 100% happy, but this is a plan that no reasonable person could disagree with. We aplaud the DEP for their efforts and we are hopeful that all groups, including those that originally supported the MAP, can now unify support for this reasonable and effective approach. We will continue to provide updates as we get them. OTNJ has teamed up with Tread Lightly! recreation through stewardship, communication and education. Recently, some of the OTNJ staff attended a Tread Lightly! “train the trainer” course and our own Pola Galie will be giving a Tread Lightly! talk on Sunday, 4/17/16 at the Lighthouse Center for Natural Resource Education, Waretown, NJ at 3:00 PM (More details to follow) We are excited about the new opportunities this relationship with Tread Lightly! will bring! 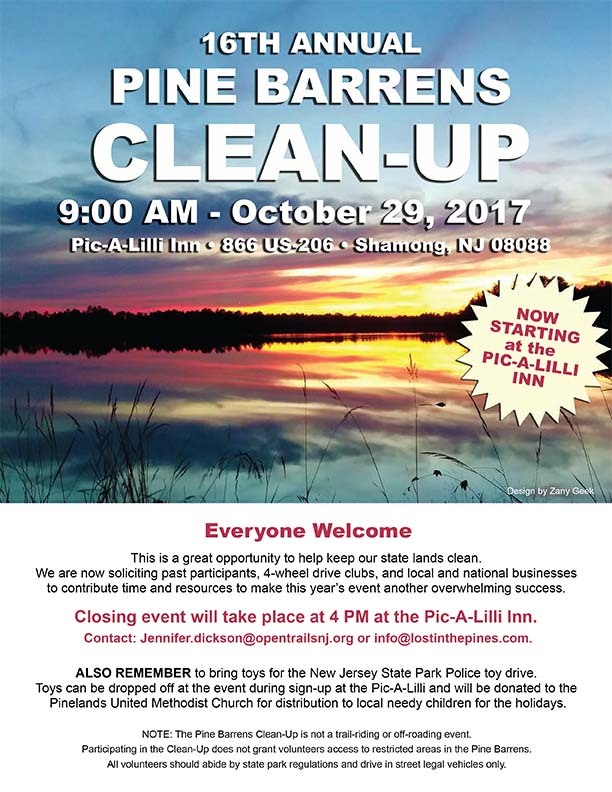 Update on Pinelands Commission Meeting / OTNJ Membership! The Pinelands Commission meeting this past Friday was well attended. Due to our rapid response we were able to head off any immediate resolutions regarding the invalid 2014 topographical map, but the battle continues. The Pinelands Commission has resolved to look at areas within Wharton that require protection. Open Trails will follow this process every step of the way, assist where possible, and fight against any overly restrictive policies. Open Trails NJ has been fighting to protect your rights for 8 months and we will continue to do so for as long as it takes. Today, we are announcing OTNJ membership! You can support OTNJ by volunteering, becoming a member or both. Our yearly membership price is $25, however, for a limited time, we are offering our memberships for a discounted price of $20! By joining you Open Trails, you will get the following: Our exclusive Open Trails decal, Open Trails Membership card and a Quarterly Newsletter. Additional member benefits will be added over time!